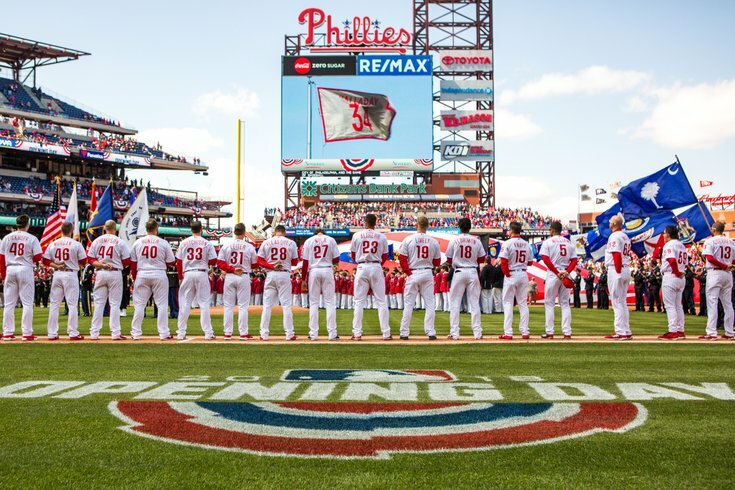 The Philadelphia Phillies line the field on Opening Day 2018. The Phillies' 25-man roster continues to shift as spring training is how just days away. Last week, the team added arguably the best catcher in the game to an already re-vamped line up. One season ago at this time, Phillies fans were scraping the barrel for a star to root for. They found one in ace Aaron Nola, a Cy Young award finalist. This year there are no shortage of players with mass appeal and All-Star potential. Philadelphia looks like it will be a contender in 2019, with or without Manny Machado and/or Bryce Harper. The Phillies swapped Jorge Alfaro, 25 and on the rise, for Marlins' star Realmuto, 27 — along with two top prospects. How much of an upgrade was it for Philly? Perhaps you are upset the Phils parted ways with top pitching prospect Sixto Sanchez in the deal, or are concerned that Realmuto remains in team control for just two seasons, but it would be hard to argue he's not a big upgrade. Realmuto has all five tools and will bat all over Gabe Kapler's line up. Hoskins' natural position is first base. With Carlos Santana at first last year Hoskins played a lot of right field, but according to Kapler, the slugger could raise his offensive game even more being back at the first base bag. "Rhys moving back to his natural position probably makes him a more comfortable player at the plate," Kapler said. "I think theres a good chance we seen an uptick in his offensive performance." At 25, Hoskins led the Phils with 38 homers and 96 RBI last season. If he can repeat those numbers, while being a bit more disciplined at the plate, he can be an All-Star in 2019. "Comfort is a good thing, I have had a lot more repetition playing there in the minor leagues," Hoskins said of his return to first. "I think just being back in the rhythm of the game, handling the ball a lot more whether it's pick offs or fielding ground balls, being in the rhythm of the game will be a lot better over the course of the year and I'm excited about that." Hernandez had a down season in 2018, with his worst offensive numbers since 2014. His position in the Phillies infield is in flux, as a signing of Machado would likely move Jean Segura from shortstop to second with Machado playing short or third base. Machado's signing would then give the Phillies incentive to trade away either Hernandez or Maikel Franco. For now, however, we project Hernandez to try and rebound with a much improved lineup around him on 2019. Perhaps in Matt Klentak's best move as Phillies GM to date, the Phils swapped Carlos Santana and J.P. Crawford for Segura and a pair of pitchers. Segura, prior to any Machado or Harper signing, is the centerpiece of the Phils lineup and would likely bat third if the lineup stayed as constructed. On his fourth team now, Segura is coming off an impressive 2018 where he hit .304 and slugged seven triples. Reports seem to make it more and more likely that Franco will get another crack at starting at third this coming season — where he may split some time with utility man Scott Kingery. If Machado goes to another squad, Philly doesn't seem to be interested in Mike Moustakas anymore. He's hit 20 or more homers in each of the last three seasons and with much if the offensive pressure lifted due to recent additions he may find his way back to form. This is Harper's spot if the Phillies sign him. If not, there will be some competition to start in right and with some outfield depth on the roster, it could be right field by committee is it's not left field by All-Star MVP slugging superstar. For all his faults, Herrera will in all likelihood be back in center in 2019. He hits for power, average and has great range in center field. He, of course, brings a little baggage but with an increased veteran presence in the clubhouse he may return to his All-Star self. Signed to a three-year, $50 million deal way back when free agency was just starting, McCutchen is a veteran at 32. He is being brought in as much for his experience and clubhouse presence as he is for his skills in the outfield. He has a gold glove, an NL MVP and five All-Star appearances. And he hit 20 home runs last season. He's a perfect fit for what Kapler and Klentak are trying to do. The Phillies front office, as well as Kapler, have voiced a lot of support for Kingery — a do-it-all utility man who was given an unprecedented contract extension out of spring training last year. His versatility could be key this season, as the Phils may have a shortage of infielders on the bench. Knapp and one of the two left fielders mentioned above will be on the bench, and if Altherr and Cozens each make the 25-man roster the Phils will have six outfielders. Keep an eye on training camp to see if an infielder plays his way onto the club, or if the team decides to leave an outfielder out. There also could be a minor move made to upgrade catcher again, as Knapp now is a serious drop off from Realmuto behind the backstop. Rumors continue to swirl about the Phillies possible interest in, well everyone. This includes pitchers — like Corey Kulber, and Dallas Keuchel, who also remains a free agent. If Philadelphia does not add a starter, the rotation will likely remain unchanged from a year ago. Jerad Eickhoff will be in the mix again, and also keep an eye on camp arms and prospects Enyel De Los Santos (who made a spot start last year) and Adonis Medina (who was 10-4 last year with 123 strikeouts in 111.1 innings in Single-A). The Phillies have an embarrassment of riches when it comes to relievers with very few locks among them. Newly signed David Robertson, one of the best in the game, is a sure thing but after that there are a lot of arms fighting for what will be either six or seven slots. Gabe Kapler certainly has his work cut out for him. Just so we don't appear to be ducking the question, we'll put Robertson, Ramos, Dominguez, Hunter, Neshak, Alvarez and Pazos as our picks.